As all PR and social media pros know, a brand’s digital presence is both very powerful and very fragile. In the attention economy, we want to break though and engage customers, and a good way to do that is by showing personality. A flippant attitude or a risky tweet can take a brand even further. Social platforms are made for snark, right? Just look at Wendy’s. 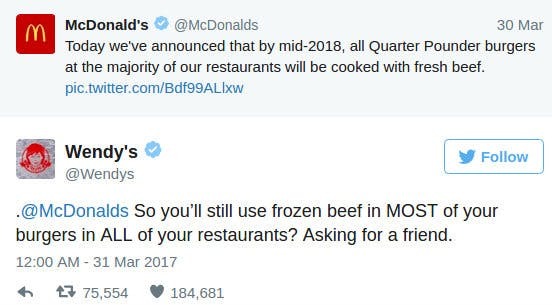 The fast-food brand is famous for its sassy social media voice, and what’s more, its strategy has won it praise and coverage in mainstream media. But research shows that consumers don’t always welcome social snark from brands. Social media company Sprout Social surveyed 1,003 consumers on what they really want from brands on social media. It found that “snarkiness” was the least desired trait, with 67 percent of respondents saying it’s undesirable. According to Sprout Content Director Lizz Kannenberg, “Consumers follow brands on social for entertainment, answers to their questions and for contests and promotions.” Not a cheeky retort. But from a public relations perspective, brands that master the art of social wisecracks can reap a PR bonanza. So, when should a brand talk back? It turns out there’s enormous variability in how far a little irreverence can go, and much depends on the individual situation. Here’s what we can learn from the most successful social brands. An irreverent social media persona is like wading into controversy; you can do it if you understand your base. There’s a good reason why a company like Patagonia can criticize the president without fear of social retribution. Its leadership knows that their loyal customers are vehemently opposed to Trump on climate issues. Conversely, the CEO of Chick-Fil-A was candid about his opposition to marriage equality when asked about the issue. The stance sparked boycotts, but it probably didn’t harm the business, because brand loyalists rallied to its support. A social media voice is an extension of a brand’s persona, and knowing your customers is an unerring guide. No such brand decision or position should be made purely for publicity purposes. Look at Thrillist, the men’s digital lifestyle newsletter. Its Facebook page is a celebration of bro culture, with silly and occasionally juvenile humor. The master in this arena just might be Taco Bell. For years, it has earned a spot on the list of the sauciest and most entertaining brands on the social web. The core customer is a young male, making it a good bet to post occasionallly risky content, and the brand delivers. From the taco emoji to its Tacobot Slack integration (that’s right, taco ordering from a snappy Slack friend is now in beta) the brand is not only cheeky, but reliably innovative. T-Mobile CEO John Legere is a great example of shrewd strategy here. His “bad-boy schtick” on social media is well suited to his flamboyant and iconoclastic personality, of course. And when Legere tweaks the big-brand competition, it’s a fairly low-risk move. T-Mobile, whose subscriber base is roughly half the size of its two largest competitors, has very little to lose by courting controversy. Picking a fight with a Goliath competitor is a time-tested strategy with a large upside – it generates plenty of attention – and very little risk. It’s a smart play. This goes without saying, but it works particularly well when it’s unexpected. 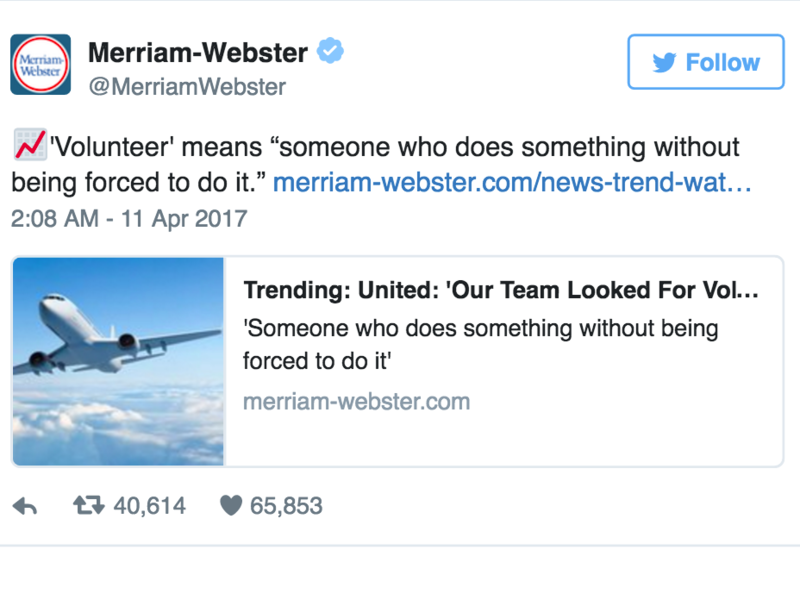 We expect humor from Charmin, but who could have predicted that the venerable Merriam Webster would gain social fame in 2017 for its sly subtweets? Wendy’s reputation for social attitude has earned plaudits, but the brand has done more than just show personality. It creates social initiatives with “meat” that pack more momentum than simple posts. Remember Carter Wilkerson, the teenager who tweeted a request for free chicken nuggets in May? Wendy’s could have tweeted a tart response, or simply accommodated Wilkerson with coupons to earn some Twitter love. Instead, it challenged the 16-year-old to earn 18,000 retweets of his request, setting off a user-driven social media campaign that drew over 3 million RTs, surpassing the record set by the 2014 Oscar selfie. The story naturally whetted the appetite of many “mainstream” media, who ate up the quirky challenge. Even though Wilkerson fell short of the goal, Wendy’s gave him a year’s worth of free nuggets, and to add substance to the contest, it pledged $100,000 to the Dave Thomas Foundation in the bargain. Well done.